I mentioned my Honeybees as a contribution to the environment and a great source of relaxation. Checkout the Photo Gallery below and watch the 50 second video. See if your blood pressure doesn’t drop a bit. I’m standing about 3 feet away from the hive while shooting this video. 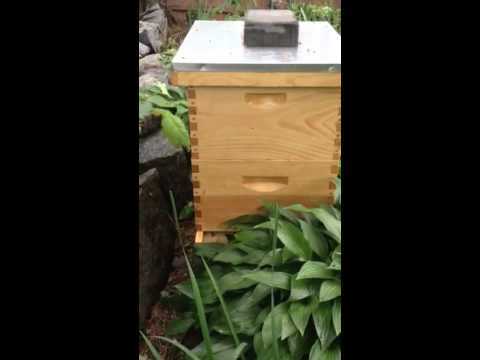 These Bees is Makin’ Honey… Honey! Susan is a successful author and a very savvy marketer. That’s why we have her on the show! Her book “Riches in Niches: How to Make it BIG in a small Market,” made it to #1 in hot business books on Amazon.com! Going Where the Competition ISN’T! All written and recorded content associated with the Voice Over Marketing Podcast are ©2013 – 2015 AR Enterprises Co., Inc. d/b/a John Melley Voice Overs & Production. All other trademarks and copyrights are property of their respective owners. This entry was posted in Podcasts, Voice Over Marketing and tagged podcast, riches in niches, Susan Friedman, Voice over, voice-over, Voiceover on June 16, 2015 by John Melley.